Ruby on Rails 3 was released just a short time ago and is a fairly big changed to previous versions of the Rails framework. People are starting to put together some great content to help developers come up-to-speed on Rails 3. I began looking around for some Rails 3 content for my own use, even though I use a variety of beta books for the purpose, I found these resources really useful. This brought me to the realization some readers may find value. This is such a great resource; offering a range of content that includes a Ruby on Rails Tutorial book as well as a set of videos with material from the book. The book is available to read on-line, purchase as a PDF or the dead tree version available from Addison-Wesley. The videos are a real sweet spot in my opinion, with 15 hrs of video training for $85. Try to get 2-days of training from anyone at that price. I have gone through both the book, Rails 3 version, and the screencasts looking for nuggets of information I may not be aware of in Rails 3. The screen casts are presented in a such a well-thought-out manner that makes them easy to follow and will not put you to sleep. Michael covers a lot of great basic topics but also includes specific coverage of such things as setting up and using Devise for authentication. He also covers Test-Driven Development (TDD) very well using RSpec. There are a lot of how-to tips with TDD alone to save you hours. I always love the content put out by PeepCode and Geoffrey Grosenbach and his recent Meet Rails 3 Part 01 was no exception. 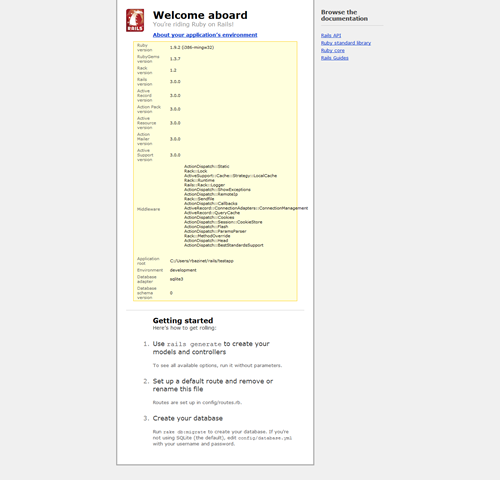 This screen cast covers the beginning aspects of getting into Rails development both on Mac and Windows. I was pleasantly surprised to see my blog post Running Rails 3 on Windows was used as a reference for users to setup and use Rails 3 on Windows. PeepCode has been providing screencasts for a long time and is likely to the first to offer those covering Ruby on Rails. The Dive into Rails 3 screencasts put out by Gregg Pollack were probably the first series focused on Rails 3 right around the time Rails 3 was released. These are screencasts talk about what is new in Rails 3, so some knowledge of Rails 2.x would be helpful to get the most out of these. Ryan Bates has been making the weekly release of a RailsCast what seems like forever now. Currently there are 240 episodes up on the site, and by my precise calculations..that?s around 4 1/2 years of great content. Most episodes range between 10 and 15 minutes of focused content on a particular topic. At last count Ryan had 25 screen casts covering different aspects of Rails 3 from the basics to new validations to implementing Devise. These episodes are laser focused to they are best used with some prior knowledge first, possibly go through the Tekpub or RailsTutorial first. The Rails 3 series from TekPub currently has 6 episodes running 5+ hours. The typical series from TekPub is one that starts off with a single episode with more added over a few weeks. I have been a Tekpub subscriber since it first opened in October 2009 and love the format of their training. In this series Rob Conery shows you Rails 3 and the core concepts involved. The focus of this series is a bit more practical than theoretical – with the goal of showing you not only Rails, but many of the tools to help you get your site up and running quickly and effectively. Long-time Ruby and Rails community member Jeremy McAnally has written up this great handbook on how to take your pre-Rails 3 application into the Rails 3 world. So many projects exist out in the wild that his handbook is invaluable. Unlike the other resources I have listed, this is not a screencast but is available as an ebook. I felt is was just such a great resource for Rails 3 and it tied in so well with coming up-to-speed on Rails 3 and the likelihood you might be upgrading a Rails 2.x application to the latest. The guide is a beauty, it really covers the pain points a developer will face when upgrading their application to Rails 3 and shows how to get around them. He includes use of his gem to help with the process as well as checklists for deprecations and the upgrade process itself. Moving your application to Rails 3? You need this guide. Well, the long-awaited release of Ruby on Rails 3 is now out and all of the Mac and Linux junkies are busy gem-installing the latest version of the framework.? What about all the lonely Windows developers out there looking through their windows (pun intended) and wondering what it?s like on the other side of the fence? Rails 3 requires at least Ruby 1.8.7 and is happy using Ruby 1.9.2, I opted for the latest and greatest. Head over to RubyForge for the Ruby Installer by Luis Lavena.? Download 1.9.2-p0 for the latest.?? A nice feature of this Ruby installer is the latest gem executable is built in, which is version 1.3.7 at the time of this writing and you won?t have to install it yourself. I installed in C:\Ruby192, which is the default, and added C:\Ruby192\bin to my path so Windows can find the Ruby executables. If you get a file-not-found or some other undesirable result then the path setting isn?t likely correct or you may want to try closing the command prompt and opening a new one. UPDATE: A reader points out of issues with installing Rails as pointed out by a post on the Ruby Forum. 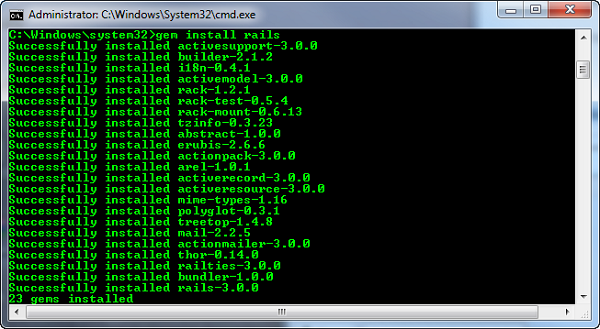 The issue was solved by simply adding a –pre to the gem command to install Rails. I use SQLite3 for most of my local development unless I need a database like MySQL or PostgreSQL.? Installing is trivial. 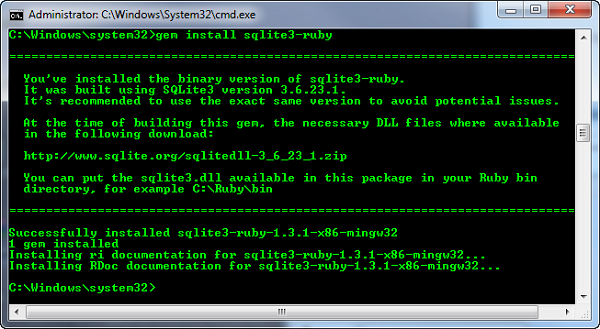 If you look at the above message when installing the sqlite3-ruby you should notice the gem relies on the sqlite3.dll and it is recommended to use version 3.6.23.1, which you can download form here.? I grabbed 3.7.2 and it seems to work fine, your mileage may vary.? If you?re interested, get the latest from the SQLite3 downloads page. 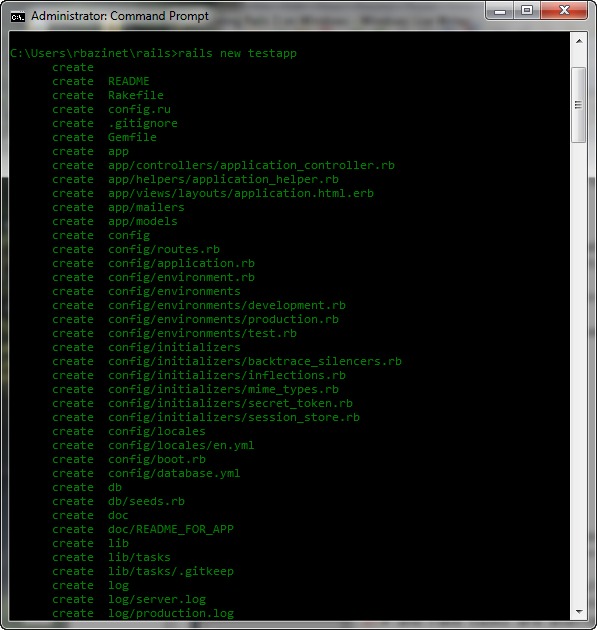 Now with the sqlite3.dll in hand (unzipped from the download), copy to the bin directory of the above Ruby installation.? In my case that?s C:\Ruby192\bin, and that?s it. This will test your SQLite3 installation and create a new development database in the testapp\db directory called development.sqlite3.? If you get any errors it is likely the sqlite3.dll is not in your Ruby bin directory, check and come back. Click on the link below the title that reads ?About your application?s environment?.? This gives a lot of detail about your Rails application configuration. Congratulations!? You have the latest and greatest Ruby and Ruby on Rails running on the Windows platform. 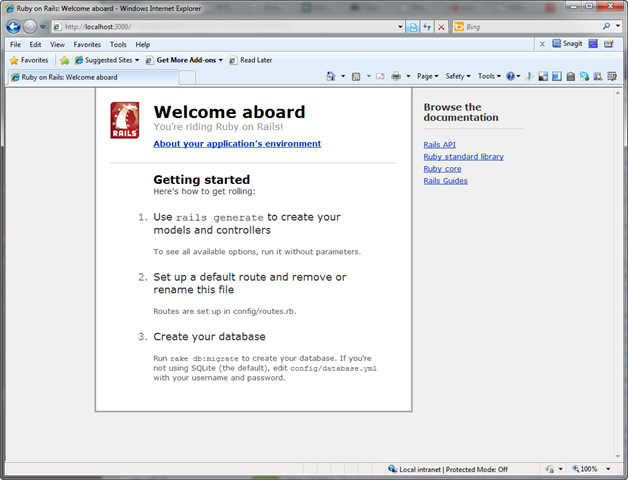 Now go out and read Mike Hartl?s Ruby on Rails Tutorial for Rail 3 and create some applications.